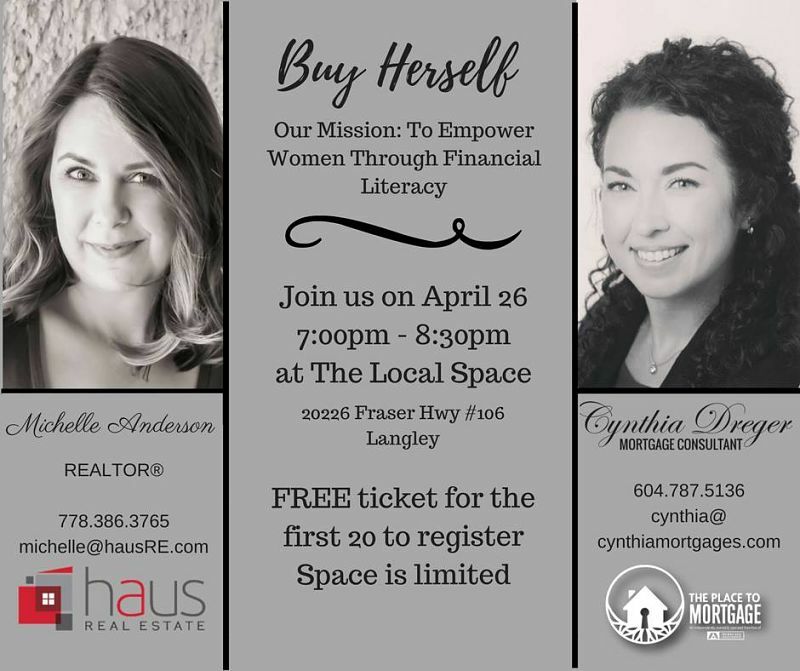 Please join Cynthia Dreger, Mortgage Consultant and Michelle Anderson, REALTOR® from Haus RE at "BUY HERSELF" a Mortgage Information night on April 26 at The Local Space in Langley. Did you know 47% of single women, and 35% married women, know very little about finances. 42% do not know their credit score. According to Statistics Canada women scored 58.6% on 14 questions regarding financial literacy. Michelle and Cynthia, have teamed up to change these statistics and help increase women’s financial knowledge. We are going to provide information and answer your questions in a relaxed, non-judgmental setting. Do you want to learn how to establish and maintain good credit? The costs involved in purchasing a home? How to position yourself for an approval on your mortgage application? Whether you are self-employed, a first-time homebuyer, new to Canada, or looking for a rental property, or any property, whatever the case, we can help you figure it out. Come to our FREE event April 26th!